An estimated 20% of people in America struggle with hearing loss, and, as the Baby Boomers age, that number will likely climb even higher. 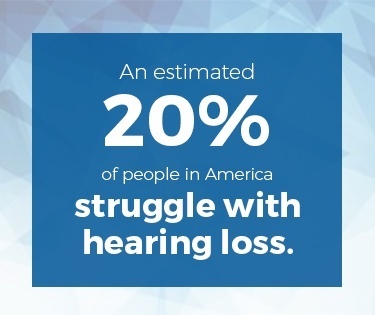 Hearing loss can occur suddenly or begin so gradually you aren’t even aware of it. Suddenly, everyone complains that you turn the radio or television on too loudly, or you realize you have trouble hearing someone speaking among a crowd at a party or an event. It may take a while to realize the problem isn’t everyone else — it’s with your hearing. If you're considering a hearing aid, it's important to learn hearing aid basics so you can understand your options. There are many common types of hearing aids, and the most important features of hearing aids are usually shared among the various types. There are also new functions found in hearing aids that make them compatible with the busy modern lifestyle enjoyed by many. Hearing aids have come a long way since the days of the “ear trumpet” and bulky models that squealed with feedback every time you shook your head! Our sense of hearing is indeed a miracle, something which many people take for granted. Hearing changes sound waves in the air into electrical signals that are received and interpreted by the brain. Any problem with the complex system that receives and interprets these signals may lead to hearing loss or deafness. When we think of hearing, we think of the ears, and that is where the process of hearing begins. Sound waves travel through the air and enter the outer ear. They travel along a narrow passageway called the ear canal. The sound waves pass through the ear canal and strike a membrane called the eardrum, which vibrates from the sound waves. As it vibrates, it passes the vibration to three bones: the incus, malleus and stapes. The three tiny bones intensify the vibrations, sending them along to the cochlea in the inner ear. This small, fluid-filled, snail-shaped organ has a partition down the middle called the basilar membrane. It splits the cochlea into two but is flexible. As sound waves strike the fluid in the cochlea, it causes the fluid to move or ripple. Waves form along that flexible basilar membrane. At the wide end of the cochlea, tiny hairs detect high-pitched sound. Hairs near the center of the cochlea detect lower pitches. As the waves move along the basilar membrane, the tiny hairs also move. This causes microscopic hair-like projections called stereocilia, to move and bend. When they bend, the tips open and chemical messengers enter the cells, causing an electrical signal. The auditory nerve sends the signal to the brain, which matches the pattern to a recognizable sound. We then ‘hear’ — we know what the sound is and we can give it a name. It’s really amazing when you consider the stems in the process of hearing. Sound waves are transformed into electrical signals inside our bodies that can be matched to patterns and recognized. Other creatures ‘hear’ through different means, but in humans and most mammals, hearing follows a similarly miraculous process. As you can imagine from a complex process, if anything goes wrong at any step along the way, the signal can be blurred, blocked or broken. That leads to hearing loss or deafness. Hearing aids can compensate for some problems along the pathway from sound wave to electrical signal but not all. 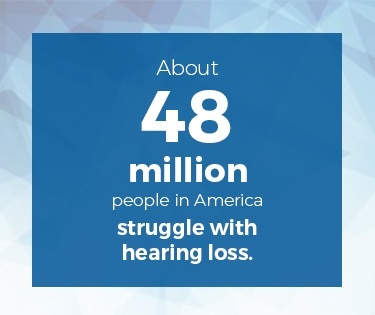 About 48 million people in America have some degree of hearing loss. Many events can cause hearing loss, including illness, repetitive loud noises, injuries and more. Conductive. Problems with the parts of the ear drum, ear canal or the three bones of the middle ear cause conductive hearing loss. These ‘conduct’ the sound waves into the ear for translation into electrical signals. Something is blocking, changing or partially blocking the sound waves as they enter the ear, or the parts of the middle ear cannot pick up the sound waves accurately. Sensorineural. Sensorineural hearing loss happens when there are problems of the inner ear. When hearing loss occurs because of nerve issues, it’s called sensorineural. Something on the translating end, which changes the sound waves into electrical signals, isn’t working properly. Mixed. Not all hearing loss fits neatly into one of the above categories. Sometimes there are several problems in different parts of the hearing process that must be compensated for to return your hearing. When both sensorineural and conductive portions are problematic, it is considered mixed hearing loss. Conductive hearing loss is most often caused by malfunctions or malformations of the outer ear, ear canal or middle ear structures. Infections and fluid buildup can cause hearing loss or damage to the eardrum and middle ear. Anything that blocks the ear canal such as a foreign object, a tumor, wax buildup or fluid from an infection can also cause conductive hearing loss. Head trauma can also cause this type of hearing loss. Less common is a genetic form of hearing loss called otosclerosis, which usually appears in young adulthood. The stapes, one of the three bones inside the ear, becomes immobile thanks to a bony growth that begins to appear in your late teens or early twenties. Sensorineural hearing loss is the type frequently suffered by people who work around loud noises. Head trauma, viruses and diseases can also cause sensorineural hearing loss. Otosclerosis can cause sensorineural hearing loss, as can Meniere’s disease. Most hearing loss occurs gradually. You may not even notice hearing loss until it is significant. If you suspect you’re experiencing hearing loss, make an appointment with your doctor for a checkup. Your physician can ascertain whether your hearing loss is due to physical problems, such as a virus or infection, or another cause. If any underlying medical issues can be corrected, this will be done first before recommending a hearing aid. Once your doctor has given you the green light to proceed with a hearing aid, find an audiologist or hearing aid center, and make an appointment with the center. The center will test your hearing one ear at a time to see if your hearing loss differs in each ear. They will measure the pitches you can hear — high or low — as well other factors affecting your hearing loss. Then they recommend common types of hearing aids to help restore your hearing. A microphone, which picks up signals from the environment. An amplifier, which increases the volume of the sound. A receiver or speaker, which changes the electrical signal into sound and sends the impulse to the ear. A battery to power the hearing aid. The common types of hearing aids address different types of hearing loss. Some are better for mild hearing loss, some for profound hearing loss. Some types work well with cell phones, so if you’re a business person on your phone a lot, you may wish to consider such a model. Talk to the hearing aid center staff about your needs and preferences. They will advise you on the models they believe will help you hear the best. In the Ear (ITE). This type of hearing aid fits inside the ear and is larger than many other types of hearing aids. It takes a larger battery that holds a charge longer. The ITE can accommodate directional microphones or devices that can pick up a single sound among many — like a voice in a crowd — so they may be a good choice for teachers and those who work with people in groups a lot. In-the-Canal (ITC). As the name suggests, ITC hearing aids sit inside the ear canal. It is small and unobtrusive but has to be custom made, which increases the price. The smaller battery must be changed frequently. It works best for mild to moderate hearing loss. Completely-in-the-Canal (CIC). This hearing aid is often suggested for mild to moderate hearing loss. This device is so small it is hard to see from the outside. It can be difficult to adjust. Some come with a remote-control device to adjust it without removing it. A popular choice for someone in need of a hearing help device that others cannot see. Invisible-in-the-Canal (IIC). About the size of a raspberry, this type of hearing aid undergoes delicate sculpting to ensure it matches the countours of your ear canal. Behind-the-Ear (BTE). BTE hearing aids work well for mild to profound hearing loss. The electronics are found inside a case that sits behind the ear. The case is connected by a tube to the ear itself where a custom-molded piece sits inside the ear. The custom molded piece is called an earmold. Sound travels to the earmold, where it then enters the ear. Behind-the-Ear-Open-Fit. This is a newer kind of hearing aid that uses a smaller ‘box’ behind the ear. It is less visible but only works well for people with mild hearing loss. BAHA. A newer type of hearing aid is the BAHA or bone-anchored hearing aid. These hearing aids are surgically implanted and attached to the bones of the middle ear, bypassing the first portion of the auditory system. They create vibrations inside the skull that can be picked up by the cochlea. 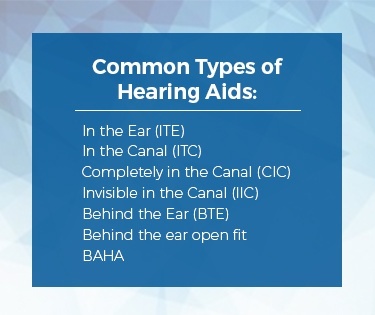 BAHA can be a last resort for people who cannot use other types of hearing aids. If you have hearing loss in just one ear, one hearing aid fitted to that ear should suffice. But, if the hearing center explains that you have hearing loss in both ears, you may need two hearing aids. It can be expensive, and many people try to get by with just one hearing aid but that may make it difficult to determine from which direction sounds come from since both ears are needed for pinpointing sound direction. There are other key features of hearing aids than the style or how they fit on the ear. These features determine sound quality and ease of use. Both amplify sounds, but analog amplifies all sounds equally. That doesn’t sound bad until you’re trying to listen to a conversation in a crowded restaurant — the sound of clinking glasses, other diners’ conversations and the music are all competing equally with your friend’s pleasant voice. Digital hearing aids are the newer hearing aid of choice and the most common type found in the United States. They’re more expensive than analog, but they can ‘tune out’ extraneous sounds and solve the problem of sound overwhelm found in older, analog models. Digital hearing aids use computer chips that adjust sound based on the person’s hearing loss and situation and adjust the levels accordingly. They can be programmed for feedback, that annoying squeal or squelch that occurs when the microphone in a hearing aid is too close to the receiver. Amplified sound is magnified and makes the horrible noise associated with feedback. Digital hearing aids can be programmed to suppress feedback. Hearing aids may include an omni microphone or a microphone that can switch between directional and omni. Omni or normal, nondirectional settings pick up sound equally from the surrounding environment. Directional microphones can help you focus on a specific sound. Think about the example given earlier of going out to dinner with a friend. A hearing aid with only nondirectional settings may make conversation difficult, but an aid that can be switched from omni to directional makes it easier to enjoy the conversation. The telecoil feature is a good feature to use during telephone conversations. These hearing aids have a switch to shift the microphone from normal to “T,” or telecoil feature. The hearing aid microphone is turned off, and the telecoil picks up the sound vibrations directly from the phone! This setting can also be used in theaters, auditoriums and other places with telecoil technology. It eliminates the unpleasant whistling or feedback sound from microphones picking up extra sound. Love to listen to music? Some hearing aids come with a direct audio input. You can connect directly to a television, stereo system or another music player using a special device that connects to your hearing aid. There are a lot of features to consider when you’re shopping for a hearing aid. What’s most important is to find the right combination of features that not only helps you hear better but helps you feel better. Hearing loss can be lonely. You can feel cut off from others and from the lifestyle you love. With the right hearing aid, you’re once again connected. Wireless hearing aids are able to paired with Apple and Android mobile devices through the use of a compatible streamer. A streamer is paired with a wireless hearing aid and an external device, such as your tablet, laptop, mp3 player, or mobile phone. Beltone hearing aids are paired directly to mobile devices using 2.4 ghz wireless technology and a streamer is not necessary. Once setup is complete, you now have a hands-free solution for listening to music or bringing in an incoming audio signal from your phone. The first step to deciding if you need a hearing aid is to have your physician or an ear, nose and throat specialist conduct a thorough examination. If medical issues are found that contribute to your hearing loss, these can be corrected. If they cannot be corrected or your hearing cannot be restored through medical means, your doctor may recommend hearing aids. Hearing aids are sold through hearing aid centers or dispensers. An audiologist or hearing instrument specialist is someone who specializes in testing hearing and fitting hearing aids. At the appointment with your hearing care practitioner at a hearing aid center, your hearing will be tested. You’ll go over the results of the test and the audiologist will go over the choices for hearing aids with you. Then, you’ll choose the hearing aid style and features from among those recommended. If an impression is needed of your ear, the impression will be taken at the hearing aid center. It may take one to two weeks for your custom hearing aids to be created and shipped to the center. Open-Fit Receiver-in-Canal (RIC) hearing aids like the one pictured above can be fit immediately after your hearing evaluation. You could walk in and walk out with your new hearing aids the same day. There will be another follow-up appointment for a fitting and to learn how to put the hearing aids in, take them out, clean them and change the battery. The hearing aids will also need to be programmed for your specific hearing needs. There’s a certain adjustment period to wearing hearing aids. At first, sounds may seem too loud or the hearing aids may be uncomfortable. Although hearing aids shouldn’t hurt, it may take a while to get used to them. If you’ve never worn eyeglasses and suddenly must wear them, it can feel odd or funny to have glasses on your nose every day. Hearing aids can be like that, too. If you are still feeling discomfort after a few days, return to the hearing aid center. They may be able to make simple adjustments that make a big difference. A follow-up appointment should be made as well so that the hearing center can fine-tune and adjust your hearing aids as you get used to them. It’s important to care for your hearing aids properly so they last a long time. Do not use rubbing alcohol or other cleaners on them and avoid getting them wet. Don’t swim while wearing hearing aids and take them out before showering or bathing. Hairspray and hair care products can damage hearing aids. You may want to put on your makeup and fix your hair, wash and dry your hands to remove any products from them, then put your hearing aids in to avoid getting any substances on them that can damage them. Turn off your hearing aid when not in use, and replace the batteries as soon as they lose their charge. You may also wish to bring your hearing aids to the hearing aid center regularly to have them inspected. Follow any special directions you’re given to clean hearing aids of ear wax, too. Store them carefully to keep them away from curious pets and children. Beltone has helped millions of people hear better through quality hearing aids. Beltone offers a five-year warranty, free batteries for life, and a 30-day personalized wearing schedule. 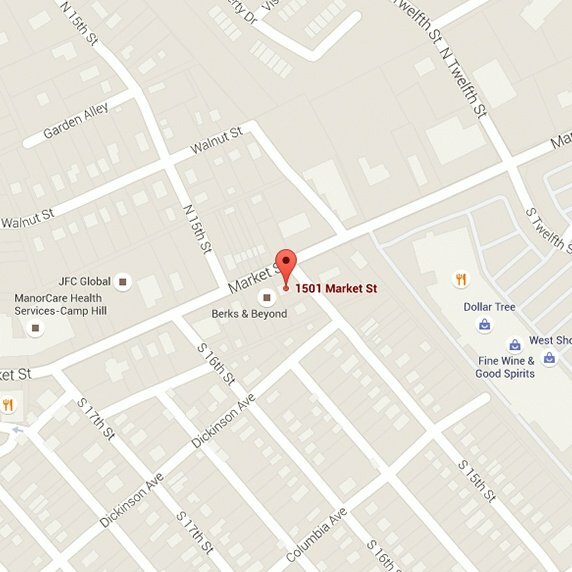 Caring staff who are experts in helping people choose hearing aids are available in all of our Beltone PA locations. Many cases of hearing loss can be corrected, restoring hearing and helping people return to the activities they once enjoyed. 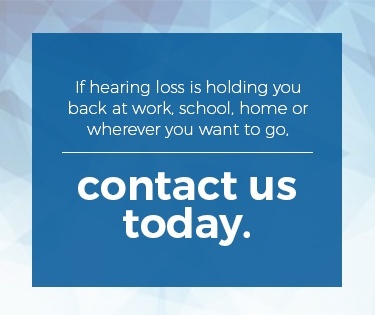 If hearing loss is holding you back at work, school, home or wherever you want to go, then please contact Beltone today. With so many choices and new hearing aid technology available, you’ll be amazed at what hearing aids can do for you.